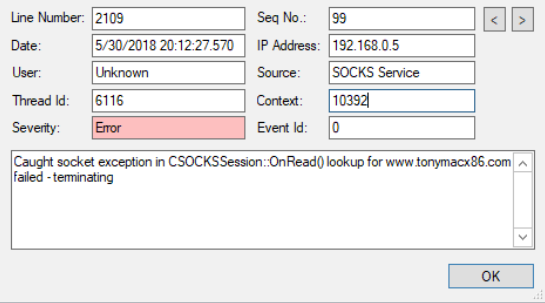 "Caught socket exception in CSOCKSSession::OnRead() lookup for http://www.tonymacx86.com failed - terminating "
"Caught socket exception in CSOCKSSession::OnClose() Connection Reset by Remote Host - terminating "
This particular site is consistently a failure, but I see others like this too. What's going on here? When I connect straight through the ISP there is no problem, so it seems to be something happening when WinGate is in the mix. 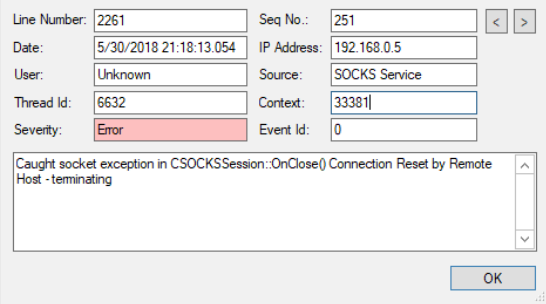 that DNS lookup failure and the connection reset by peer issue tend to indicate there's some underlying issue with either DNS resolution and/or something upstream terminating connections. To check the DNS issues, you can enable debug logging in the DNS Client. It's not unusual for WinGate's DNS client to be using different servers than the OS resolver, so you can get different results there between a browser going via the proxy or directly from the proxy computer. In the case where the traffic is https, then the client will be sending TLS handshake information which includes the server name (SNI) indication, so for example if you're connecting to a site which is hosted on a large hosting provider and they move the site, then a cached DNS result may result in this disconnection where the server on that IP is no longer serving that website. Do you have a large minimum TTL / cache expiry set in the WinGate DNS client?